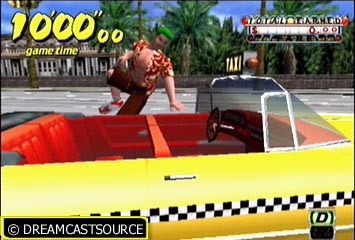 DreamcastSource - Crazy Taxi Review 40 original Pictures & Wallpapers! 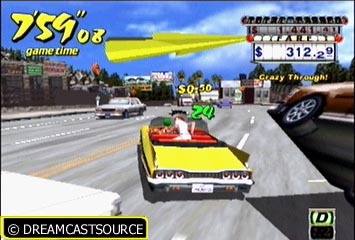 If you haven�t heard of Crazy Taxi then you�ve really got to be crazy! 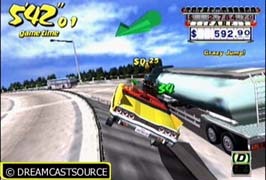 After it�s storming appearance in the arcades the game arrived to the Dreamcast with a blast and it�s quite literally an arcade perfect conversion. 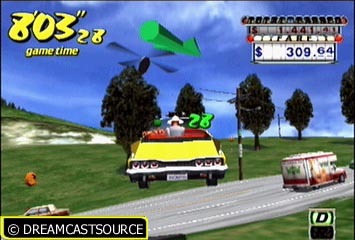 For those not familiar with Crazy Taxi: you are a cabbie and have to scour the city is search for customers who you then drop of to their desired location to earn money. Customers display a dollar symbol above their heads to distinguish themselves from others. The colour of the dollar symbol determines the distance they want to travel e.g. green dollar means the customer wants to go far, and the longer the job the more money it�ll rake in. To pick up passengers you stop in their �zone� outlined by a circle line. A brief �come in� dialogue and gesture by the cabbie followed by a remark by the customer like �watch it, you almost run me over� starts the action and the clock ticks away as you have to drop the customer off within a time limit. An arrow guides you to the location you must get to, and the location is circled with a coloured frame to help guide you there. Journey destinations are quite varied ranging from the Baseball Stadium and Yacht harbour to the Police Station and the FILA shop. The fare is determined by the distance of the journey, however you can soup the money up by pleasing your customers. Gameplay aside, the graphics are the most striking aspect of the game. On my first try on the game I spent ages marvelling at the detail and complexity of the cities. There are cars, buses, trams, vans and trucks roaming the streets, all gloriously rendered. They�re smart too, you�ll see buses politely indicate before changing lanes. Their brake lights work (wow�), they even make mistakes like everyday people. You see people walking and wandering around. The streets are lined with telephone boxes, bins, boxes, signposts etc that can be run into or over and seen being scattered on the roads leaving your wreckage trail! Everything is extremely life like, you feel like you�re actually driving through a real city. People are doing their own activities, like shopping or whatever. Can't overtake 'em? Just drive over then! In addition to the arcade game city, there�s whole new city to grasp. The city from the arcades is just like San Francisco, because of the steep roads with the centre aligned tram-lines. The new city has many neat features, including a semi-raised bridge which can be jumped over, a railway line running through the city which can be driven along through the underground tunnels, a flyover, more open space and loads of people. There�s also a brilliant �Crazy Box� mode addition where you can perfect your driving skills through small challenges like pulling off a jump or trying to drop off a number of passengers within the time limit. The challenges are fun to play, and are quite varied so they�ll be you entertained� for a while that is. The crazy box mode is a simple concept yet brilliantly fun and addictive too. Why drive on the lanes when you can drive between them? The soundtracks and music in the game are really something to shout about. Featuring adrenalin pumping rock music from the popular Offspring and Bad Religion, the soundtracks fit in perfectly with the fast paced action the game offers. After all, arcade games need this kind of music to create a sense of speed and excitement. A moment where you�re screeching around a bend with boxes flying across the road and the college girl in the back yelling �Yeh!� all topped with a funky soundtrack pumping bass through your speakers is amazing! Why can�t all games sound as good as this? Even the speech is a positive addition, and the engine rev noises, sound of people running for their lives from your crazy taxi, debris flying everywhere and the commentator blabbing �it�s party time, lets have some fun!� all fits in perfectly with the game. Even though it�s an arcade conversion, there�s still a lot to be offered by this game. You�ll find yourself coming back again and again to play this game, beating an old score or discovering something cooler. 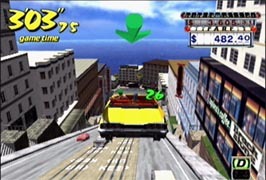 The addition of a city and the wonderful crazy box mode bring up the lifespan of the game. Each game played will be different, there�s always something to laugh at or be marvelled by. You�re going to be aiming to beat your own scores again and again. Now, a mission mode where you had set objectives (a little like Driver, PSX) would have topped the whole game off flawlessly. If there were some kind of multiplayer feature tucked away too, then that would have been awesome. Suppose I�m asking for too much there though! 9.5 Brilliantly rendered huge cities, everything from the taxis themselves to the buildings and people look brilliant! Little popup, though not a problem. Sound 9.0 Awesome soundtracks and sound effects throughout the game. There's some cool and humorous speech. Gameplay 8.0 Drive a cab through grand cities, pick up customers. Lots of freedom to do what you want! Addictive gameplay, but gets repetitive. They�re tried hard to make the game better on a long term basis. It�s kind of worked, new city and the crazy box mode are a treat! "If you're not hooked on the 1st go, then you must be dead! Every Dreamcast owner should own this baby!" Well, I honestly can say that I completely agree with Faz�s review! The graphics are awesome (of particular note are the sparks, which look ultra realistic! ), the gameplay draws you back again and again, and the soundtrack is one that deserves to be turned up to the max! There is nothing, and I mean nothing, about this game that I don�t like! It�s fun, it�s fast and it�s just plain crazy! 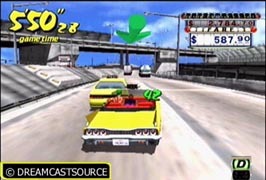 Somehow Sega have turned the mundane idea of taking people to a location into a fantastic joyride! I love, love, love this game! It is a definite must have for all Dreamcast owners! If you don�t already have this game, GET IT NOW! 9.5/10 - this game is simply awesome, and definitely deserves to be in every crazy Dreamcast owners game library! >>Check out the full set of 40 original screenshots! >>Download some exclusive Crazy Taxi wallpapers!